Any media entity that takes itself seriously relies on three R's to survive and thrive: relevance, readership and reputation. The latter is tricky. For readers to believe what you say, your credibility must be above reproach. If you sing praises to all car brands and models, then you’re definitely just in this beat for the perks. And that’s what makes Mazda an increasingly difficult proposition. The Japanese carmaker’s models are so fun to drive and look at, being objective about them sounds like a "praise release" (our critical term for glowingly positive content some “journalists” copy-paste from PR material). But the cars--the 3, the 6 and the CX-5--just speak for themselves. The first two, in fact, have won our Car of the Year award for two consecutive years. 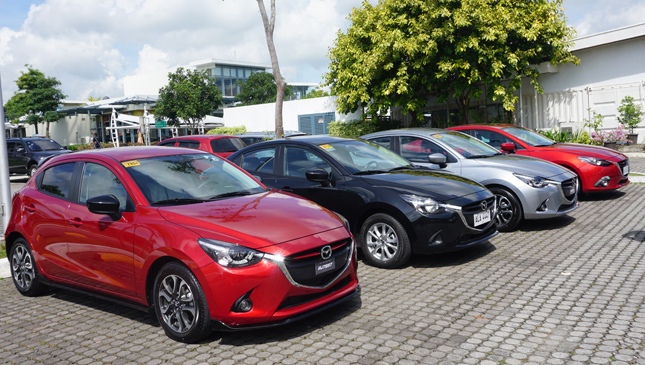 Now we have the new Mazda 2, about to enter the most competitive segment in the Philippine market. 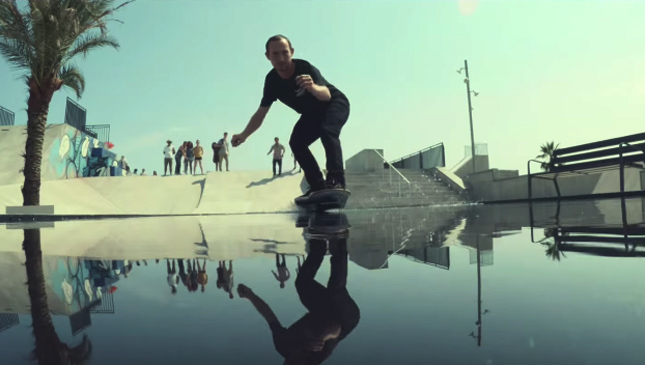 And we’ll say it now: It’s damn good. 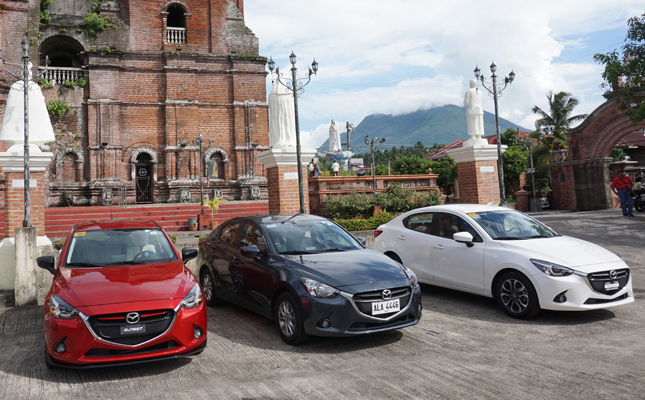 Mazda Philippines organized a media drive with its new model around the Laguna province. 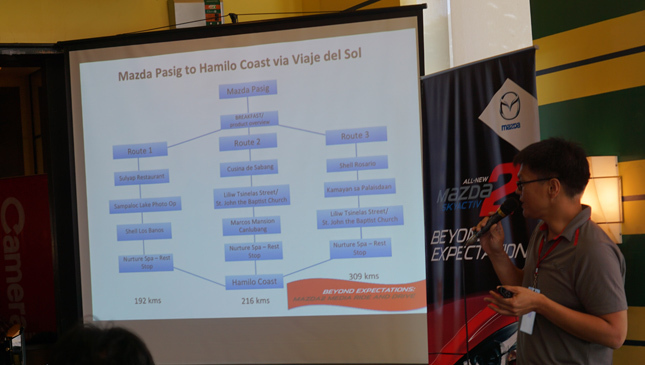 At the brand's Pasig dealership, we were just handed keys to fresh 2 sedans and hatchbacks (with a sprinkling of 3s and 6 wagons), and we were made to choose one of three routes: easy, medium and hard. The last option was a 300+km drive around Mount Banahaw. We opted for the medium option, a more relaxed 200+km journey around southern back roads and towns. 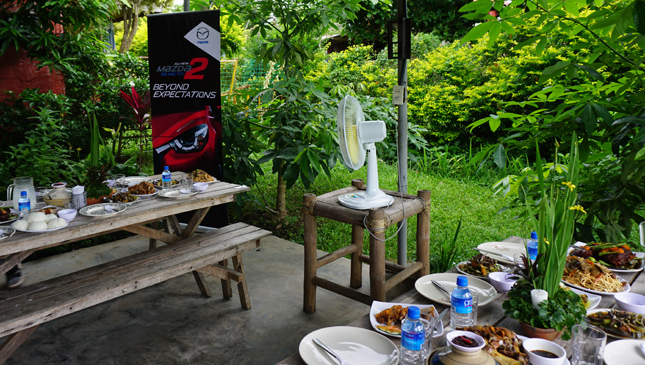 Throughout the event, there was car-swapping, so that we would get to try the different variants of the 2. 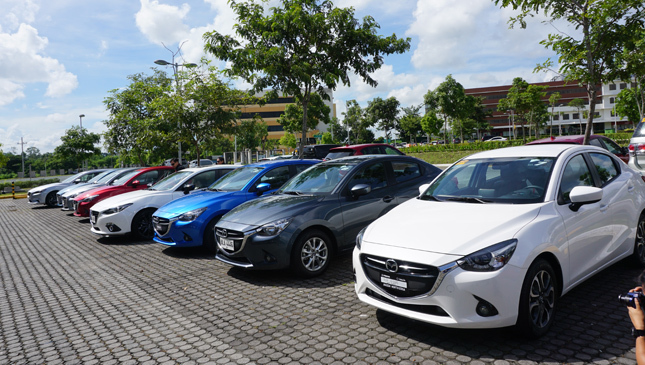 The first we got to sample was the Mazda 2 Speed, a darling of a hatchback with leather seats and racy bodykit. On SLEX, we were darting in and out of idiots who didn’t know how to stay in the slow lane. We don’t advocate weaving in and out of lanes, but there’s something sinister about the 2--like it was whispering to us and egging us to surge forward. We stopped for breakfast in the Nuvali area and changed cars, and then it was off to the main part of the drive. 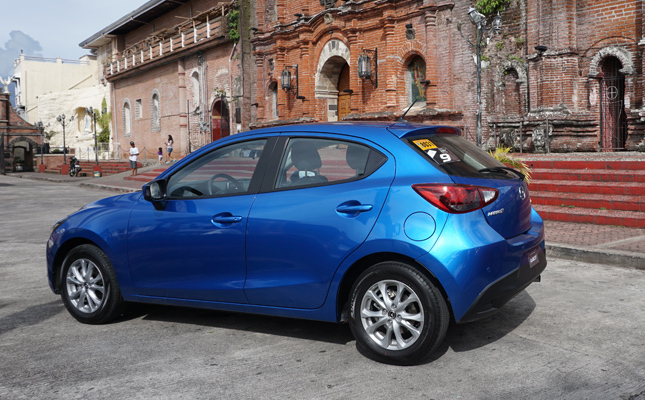 This time, our steed was a metallic-blue Skyactiv V hatchback. From Nuvali, we drove to Cusina de Sabang for a sumptuous lunch, then to St. John the Baptist Church in Liliw. We were pleased that the padded knee bolster we had come to appreciate in the 3 and the 6 is present in the subcompact sibling. 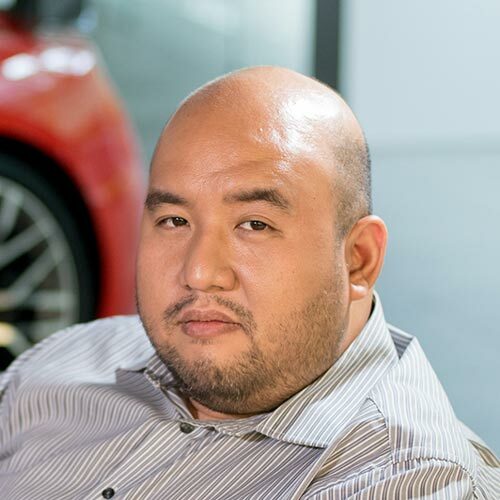 On the back roads of Laguna, while overtaking tricycles and other vehicles, the 1.5-liter in-line four-cylinder used every one of the 106 horses it had at its disposal. Or at least that’s what it felt like. By then we learned to just keep the transmission in Sport mode, and the mighty mill roared its approval. Literally. Shifts wouldn’t happen unless we neared the 6,000rpm mark, at which point the 2 was making engine sounds not heard in its segment. 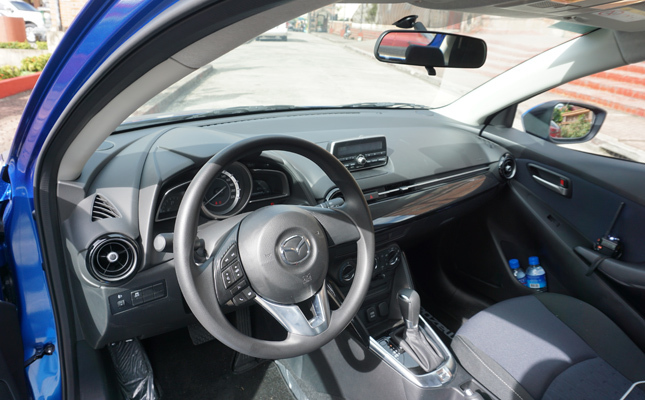 Other subcompacts have a basic four-speed automatic transmission to presumably keep costs low. 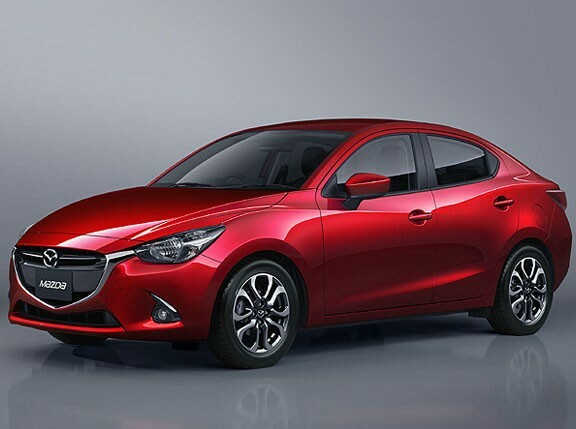 The 2 has a six-speed Skyactiv automatic gearbox with Sport mode--across all variants. The effect was relaxed cruising on open roads, and aggressive shifting--without being jerky--when our right foot demanded immediate power. Thanks to the voices whispering to our primal urges, however, we demanded power 90% of the time. 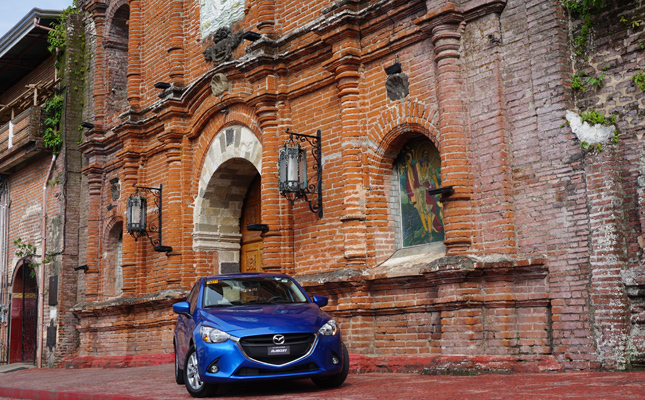 The Mazda 2’s small size made it a nimble accomplice on two-lane roads. The voices somehow stopped when we reached the church, where we took a breather before swapping cars again. 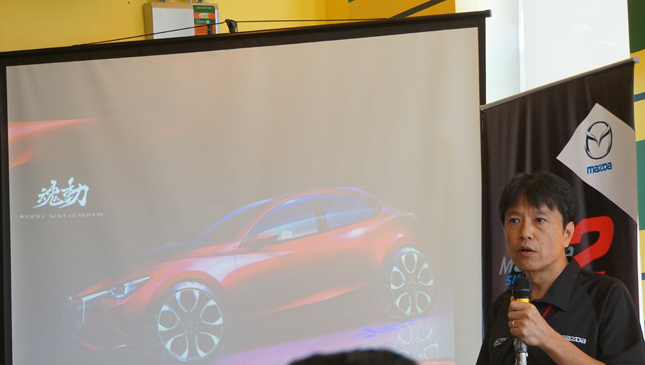 This time we got the base model, a Skyactiv S sedan. At this point, it looked like we would be disappointed with the variant downgrade. From the leather-clad Speed variant we'd had--with its leather seats, head-up display, and seven-inch touchscreen LCD (exactly the same as the one in the 3 and the 6--we now had fabric seats and a plain grayscale audio display. But what do you know: It didn’t matter because the engine and the gearbox were exactly the same. We put the transmission in Sport mode again, and the base-variant sedan whispered go-pedal urgings in our heads and drove telepathically like its more premium versions. And the basic audio system was a breeze to use, perfect for driving to your favorite playlists. Soon, we were roaring to our next destination for refreshments. The Mazda 2, we think, is like the Apple Watch: Whether you got the aluminum, the steel or the gold variant, the functions are all the same. The difference with the 2, thankfully, is that the top-of-the-line unit isn’t as unrealistically priced as the gold Apple Watch. The only feature we missed from the mid and top variants (the V and the R) was the padding for the center console, which the base variant didn't have. Because later in the evening, after a refreshing hot shower in our hotel, we felt a bit of soreness in our right knee from all the rubbing it did with said plastic console. But that was soon forgotten as we fell asleep after the very long drive. It was the untroubled slumber of writers who know what they drove, and stand by what they wrote. 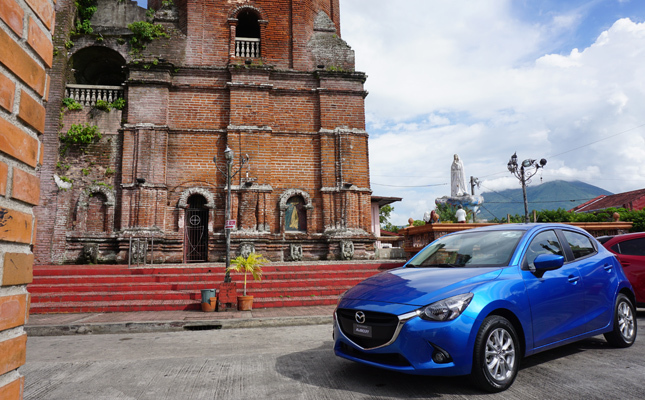 We dreamt of twisty roads, overtaken tricycles, and the marvelous handling and comfort of the Mazda 2.